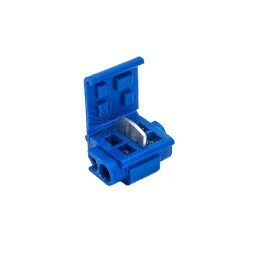 Due to the larger outside rubber coating of the #14guage wire it can no longer be used with this connector. ONLY the #18 or the #16 can be used. Some #16 wire has a slightly thicker outside insulation and you may have to force the wire into the connector, but it will work in most all cases. COLD weather. Do not install this connector if the wire, air and connector are under 55 degrees. Wait until they warm up. Some fixtures purchased on that huge global web site may not work as the lead wire from these fixtures is so tiny the connector will not make contact. Ingenious Product Review by Ron E.